Provides several useful network diagnostics to troubleshoot connectivity issues between Rhino for Windows workstations and Zoo servers. Lets you view and change the name of the Zoo server used by Rhino workstations. The Zoo server name is stored in the Windows Registry. 1. Ping: The ping diagnostics utility is the primary TCP/IP tool used to troubleshoot connectivity, reachability, and name resolution. Ping verifies IP-level connectivity to another TCP/IP computer by sending Internet Control Message Protocol (ICMP) Echo Request messages. Receipts of corresponding Echo Reply messages are displayed, along with round-trip times. Note: The Windows firewall default settings block the ICMP echo requests used for ping command. To enable ICMP echo on Windows, go to Control Panel → Windows Firewall → Advanced settings → Inbound Rules and enable File and Printer Sharing (Echo Request - ICMPv4-In) in the active security profile. 2. Nslookup: The DNS Lookup diagnostic utility displays information that you can use to diagnose Domain Name System (DNS) infrastructure. 3. Trace Route: The Trace Route (TRACERT) diagnostic utility determines the route taken to a destination by sending Internet Control Message Protocol (ICMP) echo packets with varying IP Time-To-Live (TTL) values to the destination. Each router along the path is required to decrement the TTL on a packet by at least 1 before forwarding it, so the TTL is effectively a hop count. When the TTL on a packet reaches 0, the router should send an ICMP Time Exceeded message back to the source computer. 4. 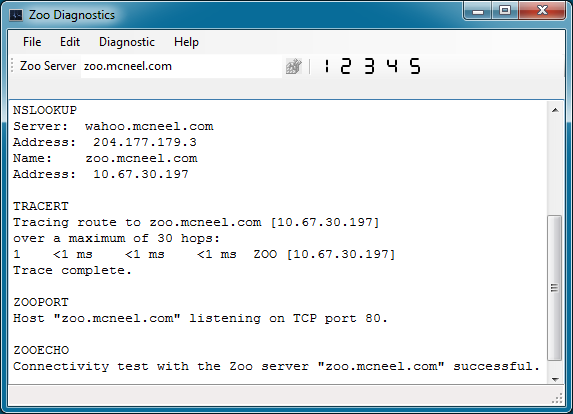 Zoo Port Check: The Zoo Port Check test verifies that a Zoo 5 or 6 service is listening on TCP Port 80 on a server or workstation. If this test fails, then make sure the Zoo server service is running. You can do this by using either ZooAdmin.exe or the Services applet in Control Panel. Also, make sure TCP Port 80 is open on any firewall software, for both incoming and outgoing traffic, running on the Zoo system. 5. Zoo Connectivity: The Zoo Connectivity test verifies that the Zoo 5 or 6 service is running on a server or workstation. If this test fails and all other tests succeed, then make sure the Zoo server service is running. You can do this by using either ZooAdmin.exe or the Services applet in Control Panel. Also, make sure TCP Port 80 is open on any firewall software, for both incoming and outgoing traffic, running on the Zoo system. This test can also fail if your system is configured to access the Internet by using a Proxy Server. In this case, the test never reaches the Zoo server. If you are using a Proxy Server, make sure you allow access to local addresses. See Using Zoo with a Proxy Server for details.